In a letter to readers at the opening of LOVERS AT THE CHAMELEON CLUB, PARIS 1932, Francine Prose reveals the real-life people, places and things that served as inspiration and background for the novel. Its title refers to a photograph that exists in the real world (as "Lesbian Couple at Le Monocle, 1932"), one of several provocative photographs by the Hungarian photographer Brassaï. The photograph itself is evocative, but then Prose began researching one of its subjects, the professional athlete and race car driver Violette Morris. Morris, Prose discovered, was excluded from the French sporting society due to her lesbianism and cross-dressing. Eventually she was enlisted to work for the Gestapo during World War II and betrayed French security in several ways before being killed by the French Resistance. As Prose notes in her introductory letter, she certainly could have written a nonfiction account of Morris's extravagant, convoluted life story --- one that would have been as dramatic as any work of fiction. But instead, she decided to write a novel inspired by Morris's life and the lives of those around her. Their voices commingle in a narrative that is also composed of several types of historical "documents," all of which combine to create a narrative that is as much an investigation of how memory and history are constructed as it is a retelling of any particular life. 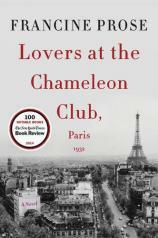 "LOVERS AT THE CHAMELEON CLUB, PARIS 1932 paints an unforgettable portrait of Paris between the wars, a time and place that holds endless fascination for readers." In the novel, Violette Morris is named Lou Villars. We learn her story primarily through a fictional biography by Nathalie Dunois, a high school teacher turned self-published author, who reveals nearly as much about herself through her narration as she does about Lou. Also contributing to the book’s plurality of voices are the faux memoirs of the baroness Lily de Rossignol and the photographer's eventual wife, Suzanne, as well as the photographer’s (here known as Gabor) letters home to his parents in Hungary. A brash American, Lionel Maine (broadly based on Henry Miller), also provides context (and more than a little comic relief) in a series of essays about French politics, culture and night life. These voices tell complementary and often overlapping stories, illustrating how difficult it can be to tell, read, or understand an account of someone else's life and times when there are multiple, sometimes competing, versions of events. How adequately can history really explain any given person's motivations, particularly when their actions are abhorrent to the teller? Prose seems to ask. In addition to offering a thought-provoking inquiry into the nature of history and memory, Prose shows us a place that is simultaneously permissive and yet mistrustful of difference, where art and culture are accompanied by xenophobia and suspicion.